During reading some interesting article on your Android phone suddenly a pop-up comes in-front of your phone screen. It’s very irritating for us which break your attention. In this guide we have to discuss how to stop or block pop-ups ads on Android phone. your Android device. Due to which lot of the person have to use third party apps to stop pop-ups ads on Android phone. But if you don’t like to download and install any third party app then you have to use given method. Lot of person don’t aware about this trick they have to face lot of problem due to pop-ups ads. Most of the person have to use different methods to stop or block these pop-ups ads. In this guide we have to discuss a simple and easy to use method which helps you to resolve pop-ups ads issue from your mobile phone. Pop-ups ads are designed by the different companies to marking his products or provide different information’s. During watching these ads you don’t have to pay additional charges. But due to these ads your mobile data limit will reached at the end stage. Here we will discuss an easy way to block pop-ups ads on your Android phone. During working on the Chrome browser you can easily stop add on your Android phone. Let’s start discuss how to block pop-ups adds on your Android phone. Step 1: First you have to open the Chrome web-browser on your Android phone. Step 2: Now, tap on the three vertical dots at the top right corner of your chrome browser window. Step 3: Tap on the Settings > Locate the Site Settings in the Advanced category. Step 4: In the Site settings window tap on the Pop-ups option. 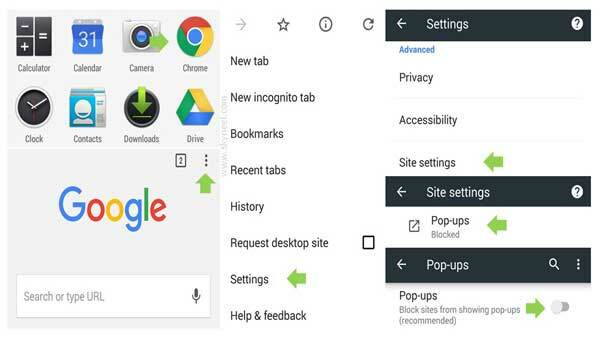 Now turn off Pop-ups to block the sites from showing pop-ups ads on your Android phone. I hope after reading this guide you can easily block pop-ups ads on Android phone. If you have any suggestion or query regarding this guide then please write us in the comment box. Thanks to all.